6 Piece BXA-#200 Piston Type Quick Change Tool Post Set ~ Interchangeable with Aloris and DORIAN same series tool Holders. ~ All working parts are hardened and ground. ~ Completely sea LED for maintenance-free operation. ~ Increases productivity of all lathe operations. ~ Includes a No. 1 turning & facing Holder, a No. 2 boring turning & facing Holder, a No. 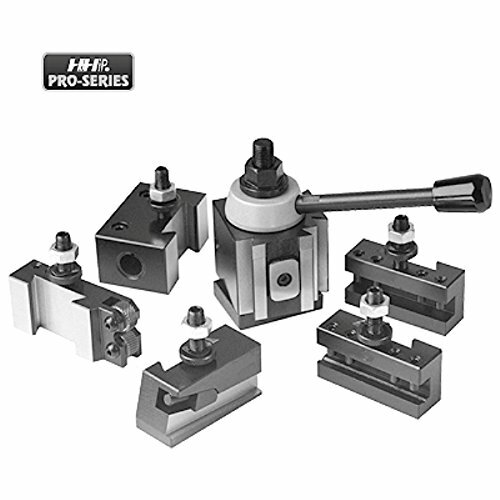 4 heavy duty boring Holder, a No. 7 universal parting blade Holder, and a No. 10 knurling facing & turning Holder. ~ A is 1.65". ~ B is 1.41". ~ D is 0.411". ~ Lathe swing capacity is 10-15". Increases productivity of all lathe operations. Lathe swing capacity is 10-15"
View More In Drilling Holders.